The Imperium seminar examines the creation of the Iberian Empires (Spain and Portugal), which would become the most important and largest organizations of power in the 16th and 17th centuries, larger even than the Roman Empire, which served as a model in many aspects. The first colonial European empires, these powerful organizations – both admired and fought – influenced the political agenda and the economic and cultural development of Europe from the Middle Ages into the 17th century. 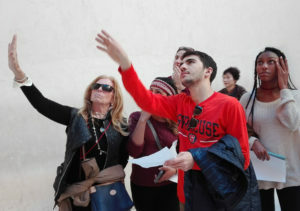 Through visits to sites in key cities of Valencia, Granada, Seville, and Lisbon, you will experience firsthand the historical, artistic, and cultural underpinnings of the Iberian Empires. This course is taught in English and Spanish. Costs: The costs for Imperium are included in your program fee. During the pre-semester seminar, students receive breakfasts and some group lunches/dinners, but should budget approximately $250-$350 for additional meals. NOTE: The seminar schedule, itinerary and procedures are subject to change without notice. The seminar is led by Elena Postigo Castellanos, Ph.D. Dr. Postigo teaches history and women’s studies for the Universidad Autónoma de Madrid and Syracuse Madrid. Patricia Espinosa teaches history of art at Syracuse Madrid.